Ever since I moved to Minnesota, which is just over 7 years now, my skin has been super dry. I'm exposed to temperature extremes like hot summers and super cold winters, insanely windy days almost year-round, and surrounded by farmland, which means exposure to a lot of allergens. Basically, there's nothing much that has worked 100% over the years, so often I skip the makeup routine to avoid the flakes and just use lots and lots of moisturizer. A few years ago, my facialist suggested regularly exfoliating to sluff off the dead skin before moisturizing, and using a good toner twice a day. Admittedly, I haven't been consistent, but I do exfoliate once a week and occasionally splurge on a spray toner. Recently, I came across Paula Begoun's website, Cosmetics Cop, which has highly detailed reviews, ingredients, and brand information for every skincare product I could think of. The experience of browsing through what I keep in my bathroom vanity was incredibly enlightening, so I decided to order a few samples from the Paula's Choice product line (which is what the company is hoping for, I'm sure). After trying a few of the Paula's Choice products and weeding out some poorly rated stuff in my vanity, I hit up Target to fill in the gaps. I use this soap in the shower mostly. The Juniper Sage scent is light and neutral enough for both me and my husband, but sometimes I prefer the Lavender scent in the evening. My skin feels clean but not stripped and unlike other soaps, I don't feel a film on my skin after using it. I've begun to switch my husband's usual, more manly, soap with this one because he's been complaining of a filmy residue. 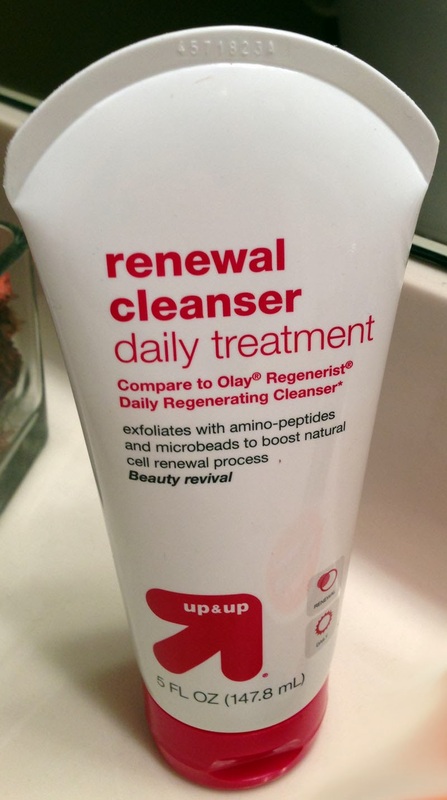 This store brand version of Olay Regenerist Daily Regenerating Cleaner is a mild exfoliating cream cleanser. I get the exfoliating effects of a scrub like the more risky St. Ives Apricot Scrub (see the Cosmetics Cop review) with the gentle cleansing of an Olay-like product. Though this review says it's "good" and not "best," I'm content that my skin doesn't feel raw and yet feels clean. Cosmetics Cop isn't so pleased with this toner but when I got to the store, I blanked on what to get. I love Boots so I went with this toner. I can't tell what toner is supposed to do but I'll use it for now and then try something else when it runs out. This really doesn't seem to fill wrinkles, even the itty bitty lines I have around my mouth and on my forehead. However, I do like how well it acts as a primer and that's why I use it a couple times a week before applying makeup. I like it better than RevitaLift Miracle Blur since it doesn't get cakey or flake, but if you're really looking for filling a few lines, the RevitaLift product does a better job at masquerading if you apply it just right. This SPF 25 daytime moisturizer has a good amount of sunscreen, goes on well and plays nicely with my foundation. I sometimes apply the foundation while the UV Cream is wet for a more natural, translucent finish, and for evening, I wait until it's dry and apply a thicker foundation. I've been using this for years with no complaints. My skin feels good when I remember to put it on (most days) and I feel more confident knowing there's some sun protection in my moisturizer. I ordered 6 of these samples and have used two so far. I don't know what it's supposed to do since I wanted to test it sort of blindly, but when I put it on, my skin feels cooler and fresh. I can leave it on overnight if I want and I don't look like a green monster like when I use other types of masks. I honestly can say my face has felt more refreshed and way less dry since trying this mask, so when I'm out of samples in a couple weeks, I'm definitely ordering the full-size product from Paula's Choice so I can keep this up as a weekly treatment. This is the Walmart brand version of Eucerin Intensive Repair Very Dry Skin Lotion. I use it mostly on my hands at night since I get Eczema redness and cracking seasonally, but when parts of my face are so dry that I'm flaking, I use this at night. It's usually just once a month but it does the trick so I can feel more girlie and less blah in the morning.